BJJ Brazilian Jiu-Jitsu In Portsmouth Hampshire UK. Welcome to Pure Art BJJ Brazilian Jiu-Jitsu Martial Arts! With us you can learn 100% Real Authentic BJJ in Portsmouth in a Friendly Positive Atmosphere with Patient Teaching and Exceptionally High Levels of Individual Support for you! We are a member club of the UKBJJA. United Kingdom Brazilian Jiu-Jitsu Association meeting and upholding their required high standards of safety and excellence in our club and the instruction we deliver you. To Get in Contact & Come Try A Free Trial Session Of BJJ In Portsmouth! + Receive A Free 1HR Private Lesson When You Join For The Month! Highly Effective Martial Arts For Self Defence! BJJ uses correctly applied technique and efficient positioning based on science in order to create leverage which allows you to defeat a larger person without having to rely on muscle and brute strength! Proven in MMA And Tested Under Real Pressure! Unlike other martial arts Brazilian Jiu Jitsu has been tested under real fight pressure and proven to work by MMA Mixed Martial Arts Fighters, it is used, relied upon and endorsed by Law Enforcement, Military, Special Forces and Security Personel worldwide. Simply put it's the real deal for one reason, it actually works! Click Here Now! To find out more about training the Martial Art of Brazilian Jiu-Jitsu with us. Used in Self Defence, Sports Competition and Mixed Martial Arts MMA. We hope to see you soon! BJJ In Portsmouth, Southsea, Havant, Fareham, Gosport, Chichester, Petersfield & Hampshire Area. Group Martial Arts Classes and Private 1-2-1 Lessons. Used for Competition, MMA and Self Defence! To Find Out Class Times And Location & Come Get A Completely Free First Class Now! Great for Self Defence & Fitness! 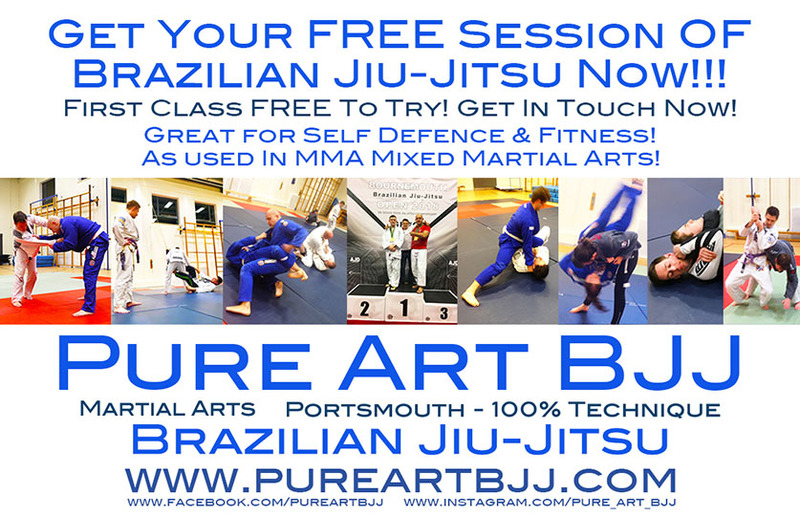 April 2019 Classes Are Now Underway At Pure Art BJJ Portsmouth. Come Try Us Now!